Hanabi, the winner of the 2013 Spiel Des Jahres (Game of the Year) award, is a game that I have wanted to try out for some time. 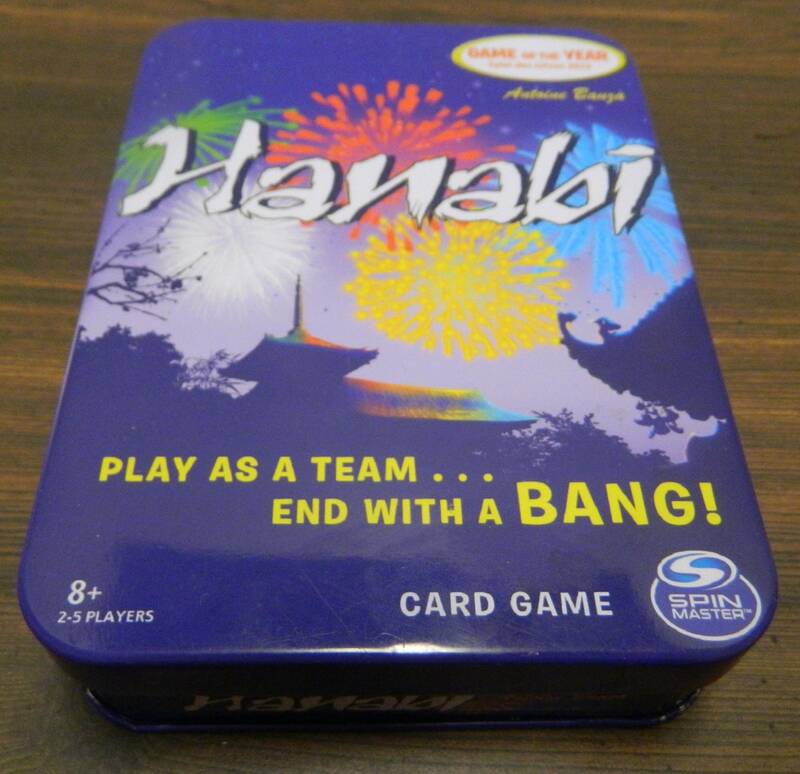 What really intrigued me about Hanabi is that it was such an original idea for a card game. Instead of playing by yourself, all of the players work together to try and create the perfect fireworks display. Unlike most card games, players cannot see the cards in their own hands and instead see all of the cards in the other players’ hands. Through the use of clues, players must deduce what cards they have in their own hand in order to create the perfect fireworks display. At times Hanabi can be a little on the easy side but it is worthy of winning the 2013 Spiel Des Jahres as it combines simple gameplay with a surprising amount of strategy to create a truly original experience. Place the eight blue clock tokens face up on the table. Stack the four black fuse tokens on the table with the longest fuse on top and the explosion on the bottom. The rest of the cards are set on the table (black and white side face up) to form the draw pile. When players pick up their cards, they can only look at the black and white side. Whichever player is wearing the most colorful clothing will start the game. Play then moves clockwise. In order to give another player a piece of information they must return one of the blue tokens to the box. If there are no blue tokens remaining, players are unable to take this action. Color: The player can tell another player how many cards they have of one specific color. They then point to the cards of that color. Number: The player can tell another player how many cards they have of a particular number. They then point to the cards of that number. A player holds these four cards. The other players could tell this player that they have two red cards and point to the two cards on the left. They could also say that the player has two ones and point to the two ones. When giving information the player has to give complete information. If a player is giving information about a color they must point out all cards of that color. If they are giving out information about a number they must point out all cards of that color. When a player decides to discard a card, they place it in the discard pile to the side of the draw pile. They will then draw a new card from the draw pile making sure not to look at the colored side. By discarding a card, the player is able to take one of the blue tokens from the box and return it to the table. If there are no tokens in the box, players cannot take this action. This player has discarded a card so they get to take back one of the clue tokens. When a player is confident they know what a card is and can play it successfully, they can choose to play the card to the table. 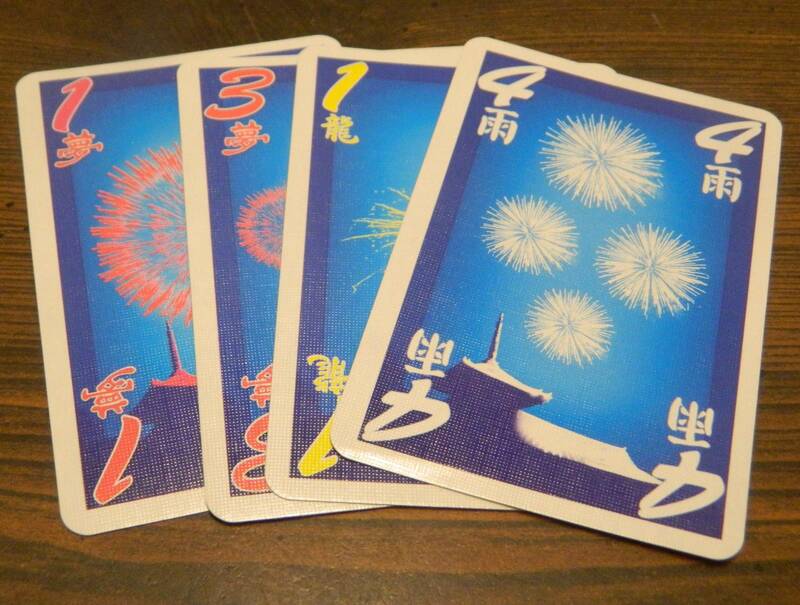 When creating fireworks in Hanabi each firework begins with the number one card for the color. Players then need to play the two card, three card, four card, and finally the five card. Players can only create one firework of each color. Depending on what card they play one of two things will happen. The card is a one for a color that hasn’t been started yet. 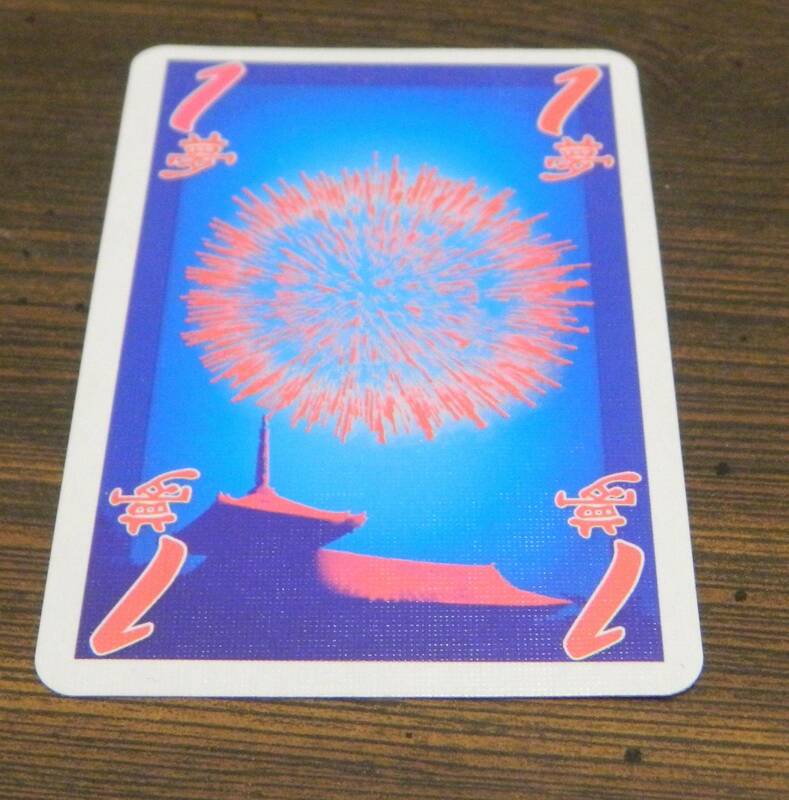 The card extends a firework that has already been played. For example playing a two green on a one green. The card finishes a firework. For example placing a five on top of a four of the same color. When a firework is successfully added, it either starts a new firework (if it was a one), or it is added below the cards of the same color. This player has played a red one. As no other red ones have been played, this card is played to the center of the table. If the card has already been played or is not the next sequential card of the corresponding color, the card is discarded. The player takes the top fusek token and places it in the box. Along the bottom are two cards that couldn’t be played. The red five couldn’t be played because the red four hasn’t been played. The white three couldn’t be played because a white three had already been played. In either case the player who played the card draws the top card from the draw pile making sure not to see the color side of the card. 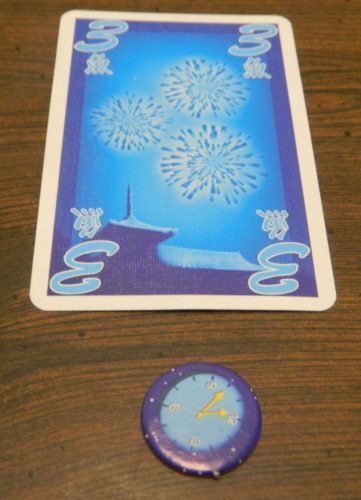 When the players complete a firework (successfully playing a five), they get to take back one of the blue tokens from the box. The players have completed the red firework. They will get to take one of their clue tokens back. The game can end in one of three ways. 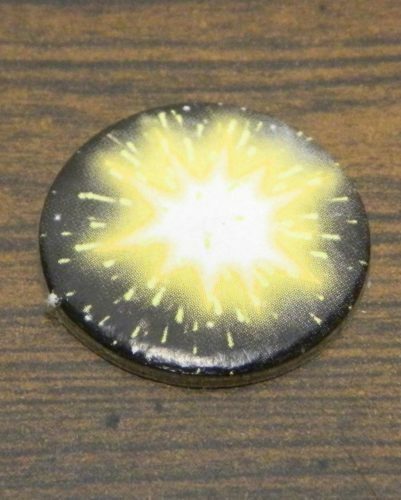 If the players discard three fuse tokens revealing the explosion token, all of the players immediately lose the game. 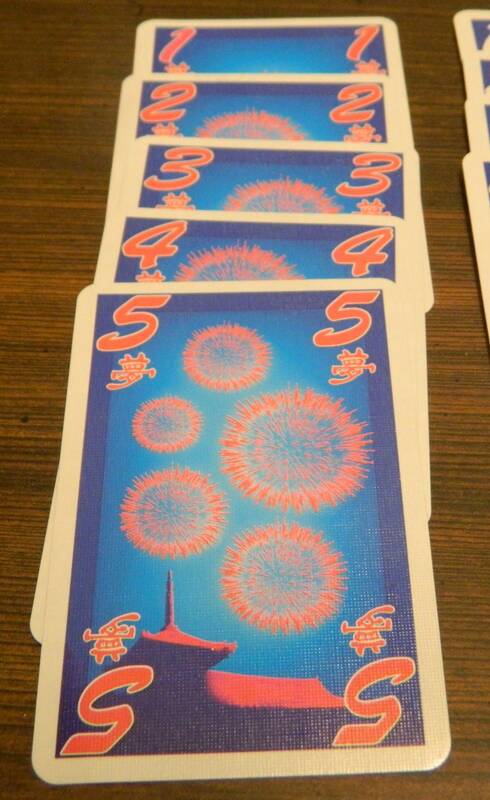 If the players successfully complete all five fireworks, the game ends immediately. The players score 25 points, the maximum score. This team has successfully completed all five fireworks. They have scored a perfect 25 points. Finally if the players run out of cards in the draw pile, each player gets one final action. After each player has taken their turn, the game ends. Players count up the highest number for each color that they were able to successfully play. This is their final score for the game. The game has ended. The players have fully completed three of the fireworks, 4/5 of one of the fireworks, and 3/5 of a firework. This team has scored 22 points (5+5+5+4+3). Add in the 6th suit of cards (multi-color) to the game. The multi-color fireworks are treated as their own firework when giving color information. The players try to complete all six fireworks for a maximum score of 30. Add in the 6th suit of cards but only include one of each number for the multi-color firework. The players try to complete all six fireworks for a maximum score of 30. Add in the 6th suit. The multi-color cards are now treated as wilds. When giving clues, the players can not give a clue about the multi-color suit. In clues about the other colors though, the multi-color cards count as a card of every other color. The multi-color fireworks are still used to build their own firework though. The game does not end when the last card is drawn. Player continue playing cards, discarding cards, and giving clues. With this variant there are only two outcomes. The players lose if they run out of fuse tokens or they are unable to finish a firework because they discarded the last copy of a card they needed for a firework. The players can only win the game if they fully complete all of the fireworks. 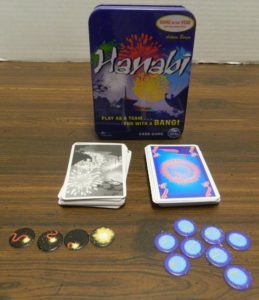 When I first heard of Hanabi, it was a game that I knew I wanted to try out. I have always been a fan of games that try something new. I have played over 700 different games at this point and there are too many board games that basically do the exact same thing. Instead of playing it safe Hanabi wanted to try something new which really intrigued me. Being a fan of cooperative games was another reason why I really wanted to try out Hanabi. While I think Hanabi is slightly overrated, it is deserving of the praise it has received as it is a truly original experience. Basically the premise behind Hanabi is to build a fireworks display by playing cards in numerical order in five or six colors. At first glance this appears to be kind of basic and has been done in many other card games. What is unique about the game is that it is a cooperative game where all of the players must work together. There is also the fact that you can’t see what is on your own cards but can see all of the other players’ cards. Thus players need to work together in order to figure out which cards each player holds so the cards can be played in the right order. One of the things that I like most about Hanabi is that despite being a highly original game, it is quite accessible even to people that have never played a similar game before. I honestly think you could teach the game to new players in just a couple minutes. While the game has a recommended age of 8+, I think children slightly younger could play the game even if they don’t understand all of the strategy. The reason the game is so simple to play is that you basically choose between three simple actions for each turn. You can give information which breaks down to two types, discard cards or play cards. The game is so straightforward that even people who rarely play card/board games should have no problems playing the game. Despite being so accessible, there is actually quite a bit hiding under the surface. Hanabi is not the most strategic game but your strategy is likely going to determine whether you are successful. The key to the strategy in Hanabi is giving the other players the right piece of information. It is easy to give another player information that will help them. To truly do well in the game though, you have to give valuable information as there is a limit to the amount of information that you can give in the game. You need to analyze all of the different pieces of information that you can give the other players, and then choose the piece of information that is most helpful. You would be surprised by how much information a player can glean from being told how many cards they have of a particular color or number. When thinking of what information to give, there is more to it than just giving the player information about a color or number. If both players are on the same wavelength, you can actually get quite a bit more information out of a clue. As long as the players are careful, you can put some context into the clues that you give. For example if I give information about the number of ones that a player holds, that likely means that I am telling the player that they should play those cards as they are of colors that haven’t been played yet. If all of the ones have been played though, I gave them that information to let them know that they can discard those cards. That is just one example of using context clues along with the actual information given to try and give a teammate more information than just the clue itself. Being able to hint towards the exact identity of a card or when the card should be played within one clue is huge in Hanabi. You are only given a limited number of clues in the game, so you don’t want to waste them. You technically can identify every card in the game with two clues but it is beneficial if you only need to use one clue. In situations where you need to use two clues for a card, it is a good idea to phrase at least one of the clues in a way that gives the player information about their other cards. You can reacquire clue tokens but you need to discard cards in order to get them back. As there are only so many cards that you are able to discard, you don’t want to waste the ability to give information whenever possible. Most of the time you are going to want to give clues whenever you don’t know the exact identity of some of the cards in your hand. You may occasionally be forced into discarding or playing a card though. You need to be very cautious about playing or discarding a card that you are unsure about. You don’t want to play a card that you are unable to play as you will lose one of the fuse tokens, lose the card, and not receive a clue token back. Thus you wasted the card entirely. When you are forced to guess about the identity of a card, you are usually better off discarding cards. You want to avoid discarding fives but otherwise you can discard a card knowing that there is another copy of the card still in the deck. Basically when it comes to playing and discarding cards, you probably want to be as cautious as you can. If the players are cautious the game becomes quite a bit easier as you don’t have to waste cards and take unnecessary risks. In addition to giving out good clues, there is a light memory aspect to the game. Players need to remember which clues they have been given and what cards they apply to. They have to remember all of this information while performing other actions. At first I thought this was going to be a problem, but in action it is quite a bit easier to remember the information than you would think. It is pretty easy to remember all of the information for a couple reasons. First players are only going to have three or four cards in their hand at a time. This means that you likely will only have to remember a couple different clues. The bigger reason is that you can arrange the cards in your hand however you prefer. To denote cards that you have information on, you can hold them higher or lower than other cards or you could even hold them sideways. While it is usually pretty easy to remember the clues that you have received, you don’t want to forget them as it will set you back a lot. If you have a couple forgetful players in your group, it is going to be much harder to do well in the game. Speaking of success, one thing that is kind of unique about Hanabi is that there are varying degrees of success that you can have in the game. If you are careless or are forced to make a lot of guesses, you could outright lose the game. In most cases though you are going to score a varying degree of points. The game includes a scale which determines how well your group did based on the number of points you score. Your success is ultimately determined by how close you were to getting a perfect score. 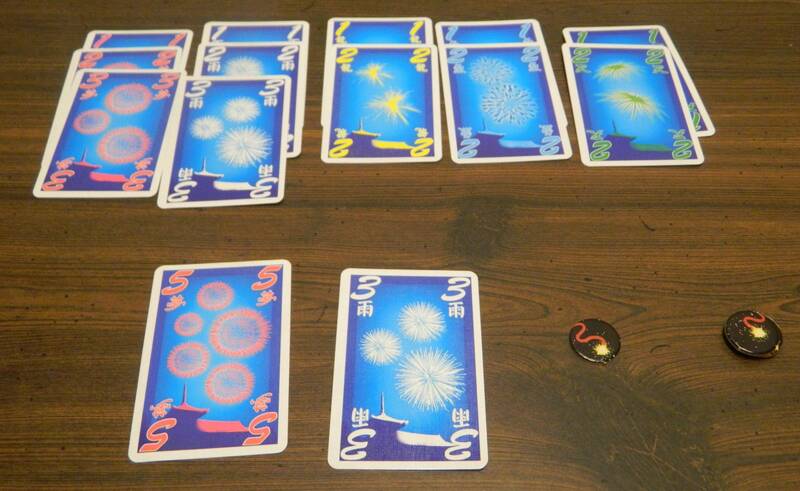 While I liked the scoring system, it illustrates one of the problems that I had with Hanabi. Maybe my group was just really lucky, but it seems to be pretty easy to do well in Hanabi. Unless you are making a lot of careless mistakes, you should be able to score quite a few points in the game. For example in the first game everyone in our group ever played, we ended up scoring 22 points. Three points short of a perfect game is pretty impressive for the first time playing a game. While it is nice doing well in the game, I think the game could have been a little more challenging. The basic game seems to be pretty easy which hurts the experience a little. The good news is that the game actually includes four different variant rules which should increase the difficulty quite a bit. Most of the variants make use of a sixth suit of multi-color fireworks. Just adding another suit to the game will make it more difficult as you have to deal with building more fireworks. What really adds difficulty to the game though is the variant where the multi-color cards must be counted as every other color when you are giving clues. This makes it much more difficult to determine what any specific card is. This means that you will either have to give quite a few more clues or take more risks which might backfire. The second issue I had with Hanabi is that it is one of those games that once you have a good strategy, you are likely going to repeat it every single game. Once you have a good handle over what clues you should give at certain times, the game kind of feels like it starts playing itself. At times the game feels like it lacks flexibility as there are specific clues that you should give at certain points in the game. This makes Hanabi feel a little repetitive after a while. This doesn’t ruin the game but it makes Hanabi one of those games that you probably don’t want to play all of the time. The final issue I had with Hanabi is that is it surprisingly easy to inadvertently cheat in the game. There are going to be times in every game where you end up giving another player more information than you are allowed to and not even notice it. It is actually quite easy to cheat in the game even if you aren’t trying to. Before even starting the game all of the players could agree on how they will give players certain types of clues. For example you could use the way you say your clue to indicate additional information. As everyone is playing together, this is not a big issue as everyone either wins or loses. It does take a little away from the game though when you can accidentally cheat and give yourself a huge advantage in the game. As there have been a couple different versions of Hanabi released, the component quality is going to somewhat depend on which version you pick up. Most of the versions of the game utilize cards but some of the deluxe versions use tiles. My version (2015 edition) has decent but unspectacular components. The cards are of a decent thickness where they should last. The artwork is pretty good but is a little on the basic side. The tokens are nothing special but they serve their purpose. The best thing about Hanabi’s components is that the game comes in a small box which makes it really easy to bring along with you while traveling. At the end of the day Hanabi has a few issues but it is still a great game. 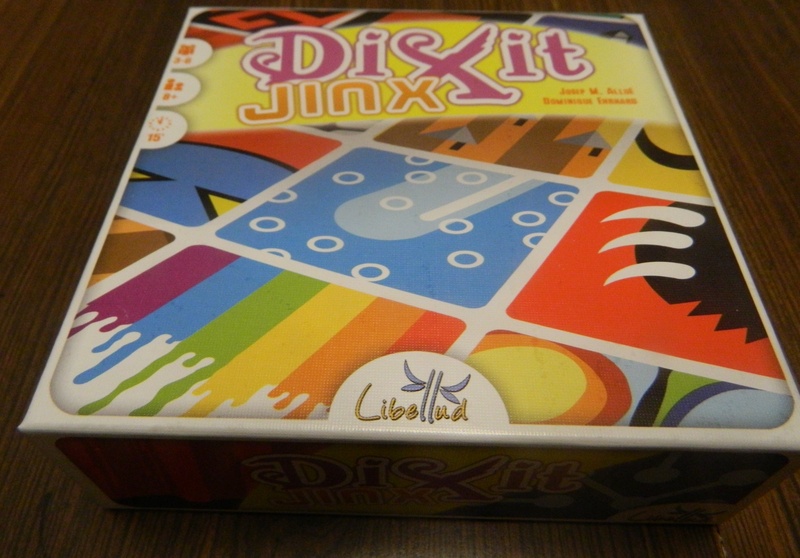 It was truly original when it was released and is deserving of the Spiel Des Jahres that it won. Basically in Hanabi the players have to work together in order to play the cards in numerical order. As players can’t see their own cards though, players have to give clues to one another which will help them figure out what cards they hold in their hands. There is a limit to how many clues that the players can give though, so players have to be smart and only give clues that give the player useful information. Hanabi is really easy to play but still has enough strategy to keeps things interesting. Hanabi is a blast to play and is an interesting cooperative experience that is worth checking out if you like cooperative games. The only issues I had with Hanabi is that at times it can be kind of easy especially since you can inadvertently cheat. Also once you have developed a good strategy, you likely will just repeat it every game. I would recommend Hanabi to most people. If you hate cooperative games or don’t really care for the game’s premise, it may not be for you. If you generally like cooperative games or think the game sounds fun though, I would highly recommend checking it out. The fact that you can usually find the game for pretty cheap is another good reason to purchase a copy of Hanabi. A truly original cooperative experience. Has a surprising amount of strategy while remaining really accessible. Can be kind of easy as long as you don't have bad luck. Once you have a good strategy you likely will repeat it every game.